We begin with a resumé of the story so far before examining how the first dragon of English literature is awakened by a burglary. Angered by the theft of a single gold cup, the dragon wreaks his vengeance on the neighbouring Geats, now ruled by old king Beowulf. The scene is thus set for Beowulf’s last battle. We shall consider the history of the dragon’s treasure and the elegy known as ‘The Lay of the Last Survivor’. We shall also elucidate the historic traditions of the wars with Swedes and Franks woven into the narrative which foreshadow further tragedy for Beowulf’s bereft people. "A dragon is no idle fancy. 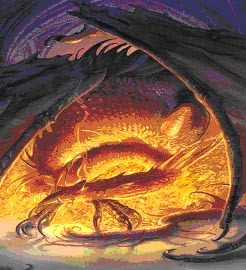 Whatever may be his origins… the dragon in legend is a potent creation of men’s imagination, richer in significance than his barrow is in gold” (J.R.R.Tolkien). Sam Newton was awarded his Ph.D in 1991 and his first book, The Origins of Beowulf and the pre-Viking Kingdom of East Anglia, was published in 1993. He is a Director of Wuffing Education as well as a media consultant in Early Medieval Studies and Time Team historian. His latest book, The Reckoning of King Rædwald, was published in 2003.